We awoke in our century-old hotel room, eager to start the day! At first, I didn’t think I would bother going down to have a shower, but then decided to put my ski jacket on and head outside. It was about 8° C and foggy, and we almost felt as though we were camping. The showers were clean and comfortable, even if they were a bit small. Buffet breakfast with all the best ingredients was served at 7:00 in the huge dining hall. They had the fireplace roaring again, and the paper’s headlines featured the Canadian dollar at par. The windows in the dining hall were the small-pane type, and the glass looked to be a century old. We asked the waiter what the contraption was on the candle in the middle of our table. Apparently it was a steel sleeve with a cap on top which spring-loaded the candle. The candle would push up, and always stay the same height at the top of this metal holder. You couldn’t tell that it was metal unless you actually touched it. The wonderful service and the elegant decor made me feel like I was in a posh resort . . . which I guess I was. We hit the road shortly after 8:00, and arrived about half-an-hour later in the Mariposa Sequoia Grove. We had to ascend the mountains to get there, and ended up at about the 6000-foot level. When we first got out of the car, it was difficult to see which trail we should take. However, we found a trail map, and headed out. We started taking pictures right in the parking lot. 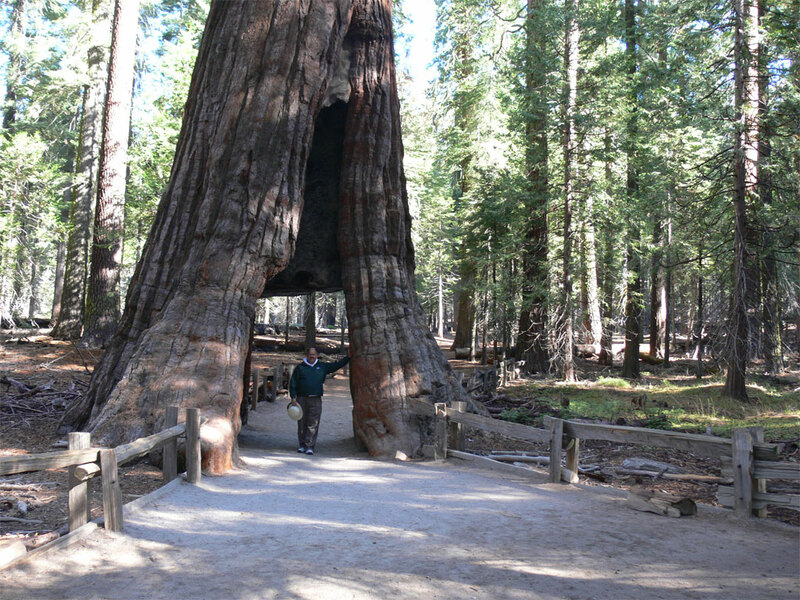 The size of these trees was truly amazing! I could not get the entire tree in the viewfinder of the camera! The trees in the parking lot had a fence around them, preventing you from walking right up to the tree. Apparently the redwoods have a very shallow root base, going down only six feet. 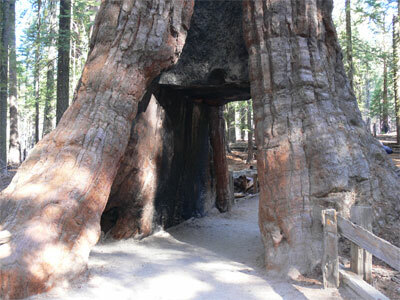 However, the roots spread out 150 feet from the trunk to keep the tree stable. Because human traffic can damage these roots, there were signs everywhere saying not to walk near the trees. 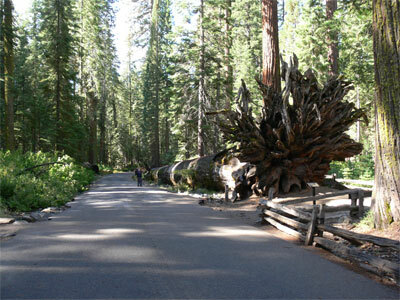 The strange thing was, many of the paths and roadways went right up to the trunks of these huge trees! We walked a third of a mile up the hill. 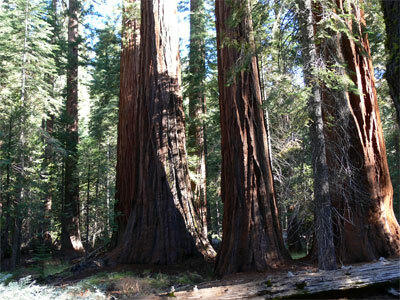 About 10% of the forest was comprised of redwood trees. 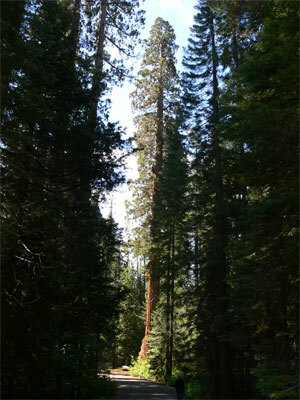 There were other large pine trees along the way which were about three-quarters the size of the redwoods. 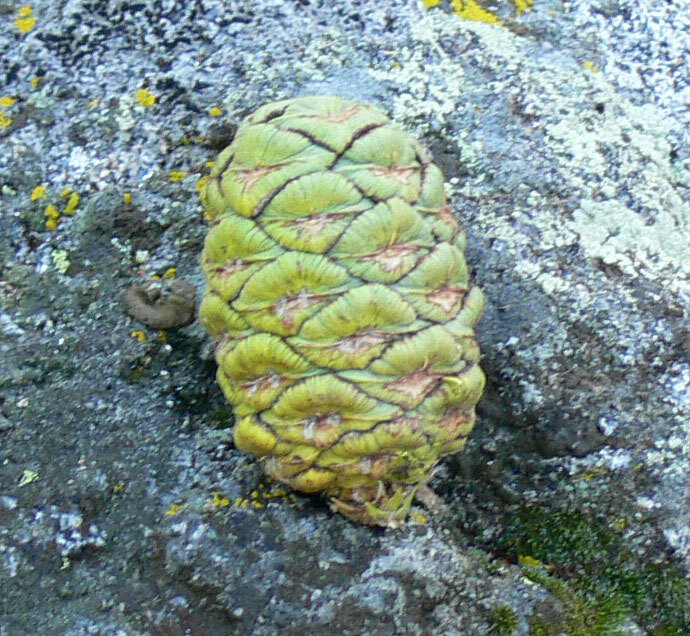 They had huge pine cones about three times the size of a typical pine cone. 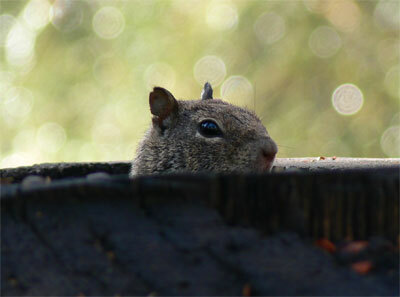 As we went along, you could hear birds in the woods, and several squirrels and chipmunks chasing about. I was able to get a picture of a different type of grey squirrel sitting on top of a burned out stump, squeaking away at me. We also came to a set of trees called The Three Graces and The Bachelor. 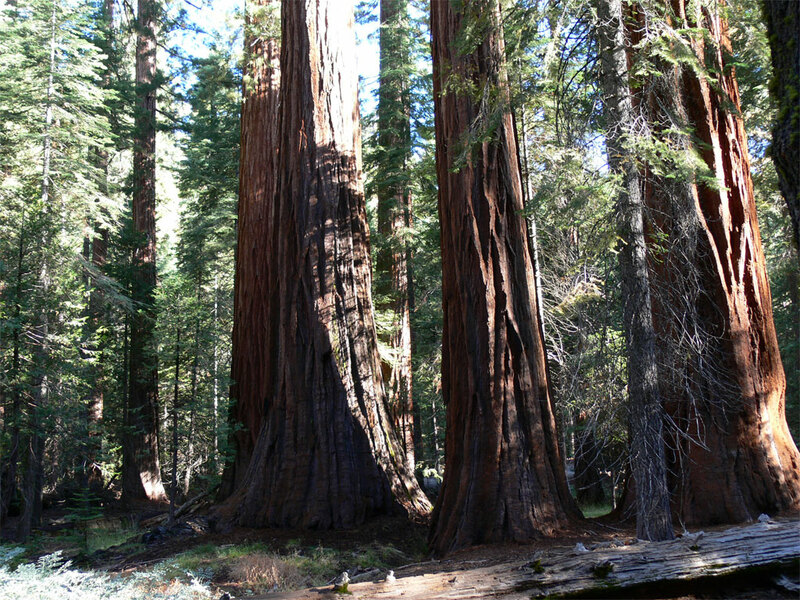 There were three large redwoods right next to each other, with another large one out in front. Apparently The Three Graces are the name of a classical sculpture. 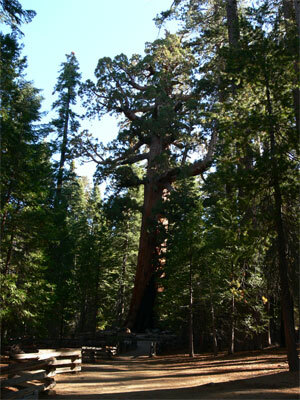 However, there was another redwood tree not far behind, which took away from the symmetry somewhat. open up and release their seeds! The path was not particularly well marked, but we carried on up the hill. It did seem that the high altitude made it a bit more difficult to hike. 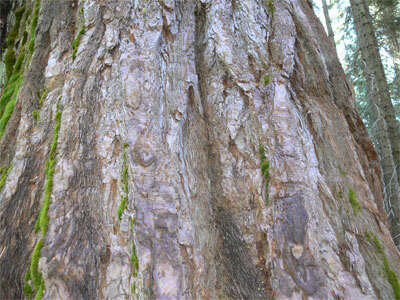 At the next crest on the hill, we came across a tree called The Giant Grizzly. This is the name of a 2000- year old giant, which indeed looks in rather rough shape. However, we noticed that there were still plenty of leaves on the top half the tree, so it was still healthy. 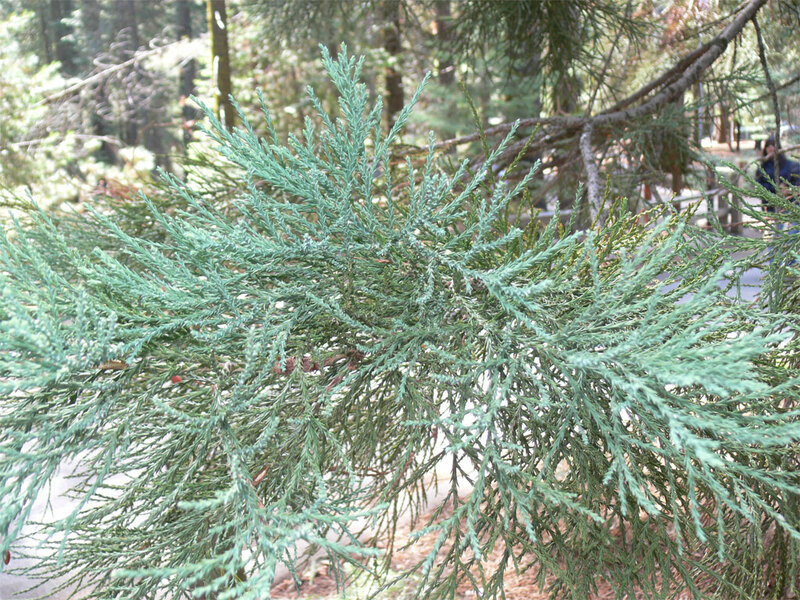 The difference with this tree is that although the branches have frequently been broken off, they keep growing! Most of the branches on the other trees are fairly slender, but this one had huge branches that looked like arms protruding from the top half of the tree. It also had the typical burn marks at the bottom of its trunk. trunks are. 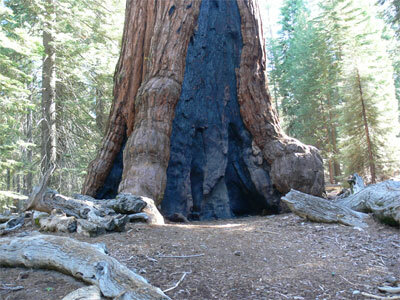 Apparently they grow to their full height in 800 years, reaching a height of about 300 feet. From then on, they continue to grow, but it is in width. We estimated The Giant Grizzly was about 35 feet wide at its base. 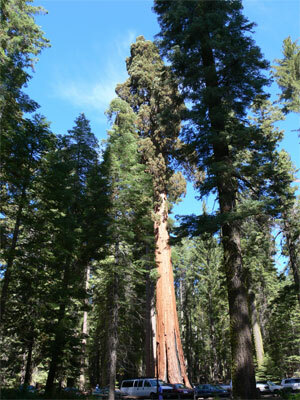 These huge Sequoias are the largest living thing known to man in terms of volume - not in height or age, but in total plant volume. 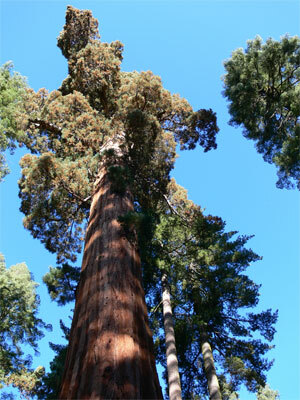 The cinnamon colour of the giant sequoias comes from a chemical called tannin which is found in high concentrations in the bark and the wood of these trees. This high content of tannin makes them resistant to disease, insect infestation and fire. Even after they die, they can take hundreds of years to decay as the tannin acts as a natural preservative. 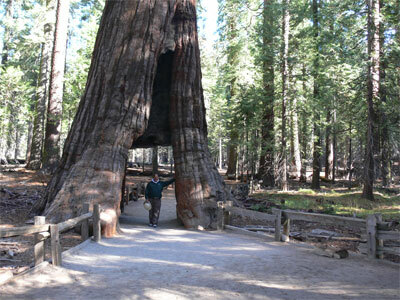 About 100 yards behind this tree was the California Tree, known as The Walk Thru Tree. Seeing this tree had been the goal of our hike all along. We took turns photographing each other in the little hallway that goes right under the tree. We also photographed, from the back of the tree, where the pathway continued. A Dutch couple arrived, and we took turns taking each other's pictures. It appears that many years ago, someone carved out the burned dead centre of the tree, and so had not really damaged the tree at all. However, the poster beside the tree said that these days, no one would be allowed to damage a tree in such a manner. The plaque went on to say that it did help promote the park and gain the status of a national park. Fire is needed to open it. Just then the truck came chugging up the hill, pulling an open trailer full of seats on which the tourists sat. It stopped where we thought it would, and we jumped on. However, the driver was not amused, and would not let us buy tickets on the spot, so we had to get off. No sense of humour, I guess. We decided to take the paved road back down the hill. This took us through a different part of the forest than the path had done. Again, I found myself taking pictures of every new tree I saw, even though I had photographed many of them by that time. 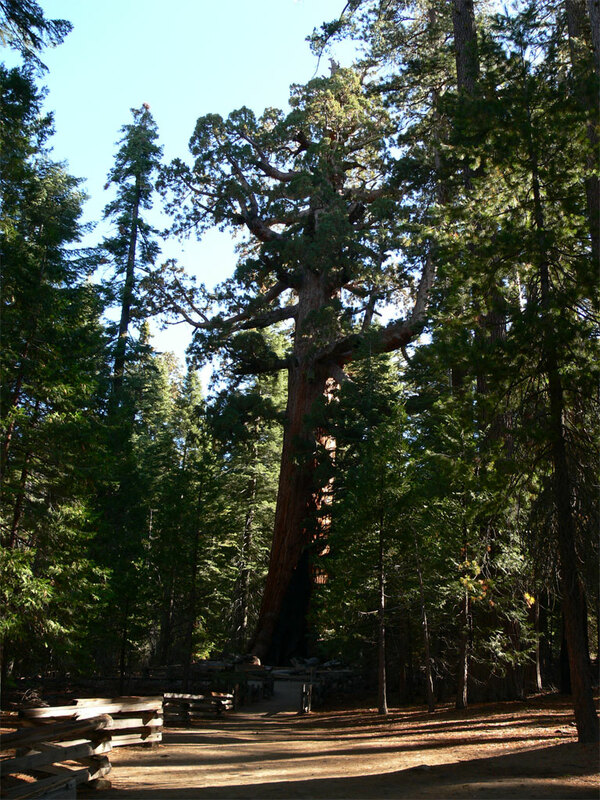 I was continually struck by the sheer magnificence of these trees! paper stacked in multiple layers. It was spongy to the touch, and just sloughs off in your hand. I couldn’t believe that this was the essential bark that protected this almost immortal tree. Rubbing the bark actually made it flake off in your hand. Incredible! When we got down to the bottom of the hill, we reconsidered whether or not we wanted to take the ride further up the hill. 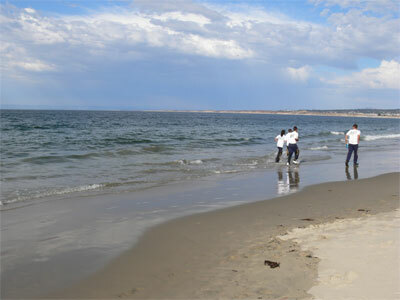 However, it appeared to be a very bumpy ride, and was rather expensive, so we decided to head back to the West Coast. As we drove to the park border, we noticed that the entry road had been closed. Apparently if you didn’t arrive in the early hours, you would find the parking lot was soon full. 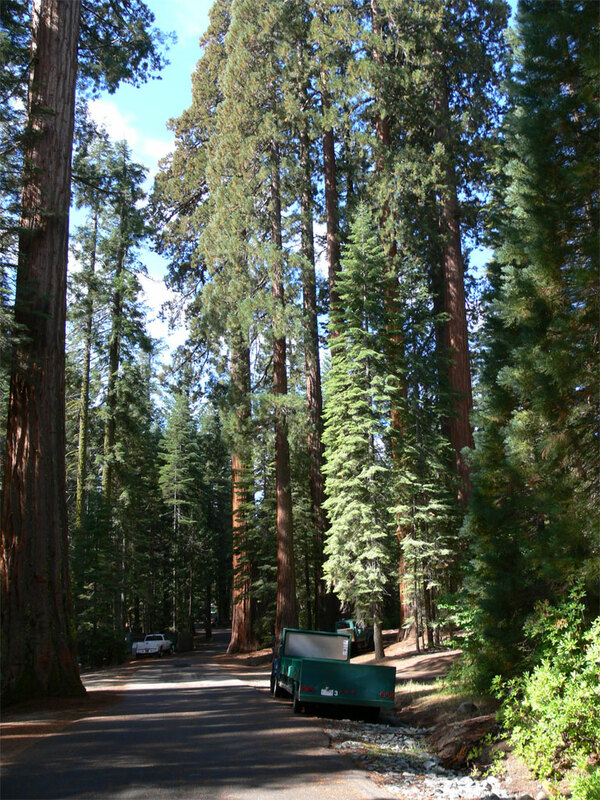 They had a free shuttle bus running from a lower parking lot up the short distance to the redwood grove. Again, it seems these national parks are being overrun with tourists. As we left the mountains, we again started going through miles and miles of fruit tree groves. It seemed everything was irrigated, as the landscape was still extremely dry. This area of California has not had rain for eight months. We stopped for lunch at a good Chinese buffet in a little farming community. Again, we found that a great many of the people there were of Mexican descent. The park across the road had whole groups of Mexicans sitting around under the trees. 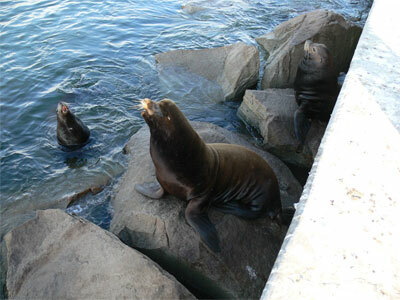 We finally arrived in Monterey on the Pacific coast around 3:00. After we gassed up, we went to see a small beach. 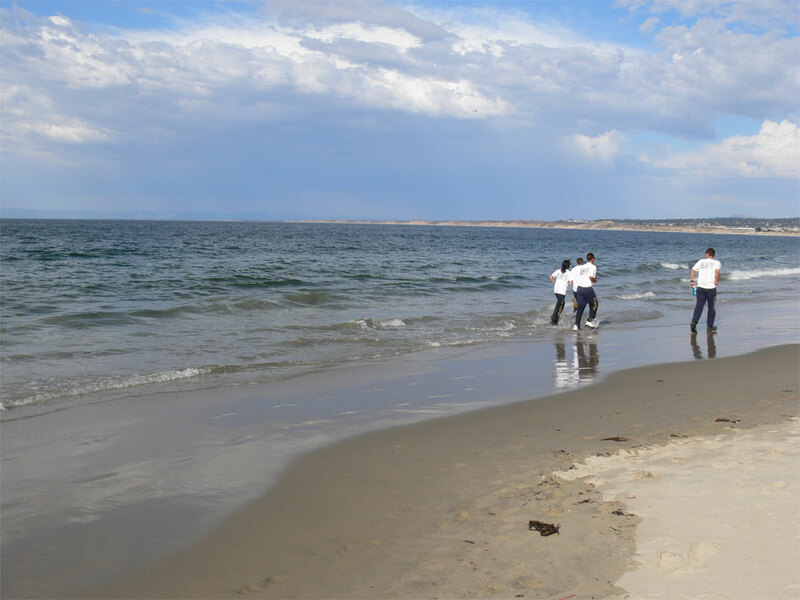 It was very strange to see people jogging in the water with their running shoes on. A whole group of navy officers ran by with one of them almost up to his knees in the water. They were in full jogging gear, wearing expensive running shoes and everything. I don’t get it?! I was starting to get a bit of a headache, and as I drove past a chiropractor’s office, I decided to drop in. He seemed to be very good, but charged $20 more than what I’m used to. We also tried to find a drugstore where I could pick up some Tylenol, but had no luck. I was at the beach, so I made some inquiries. We went to the Coast Guard pier, and there they were. What a noisy bunch! There are huge rocks which form the foundation for the pier, and the sea lions seem to enjoy basking in the sun on these rocks. But they are always fighting for a spot on the best rock. They make a very loud barking-type sound most of the time. I’d say they weigh about 800 lbs. 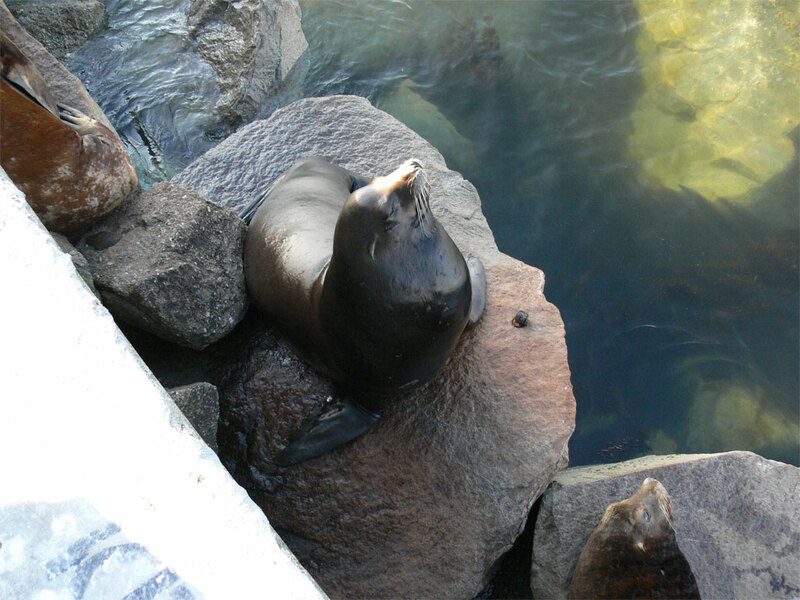 There are always a couple of sea lions swimming amongst the kelp, trying to get onto a rock. I saw the current owner bare his teeth and chase him off. 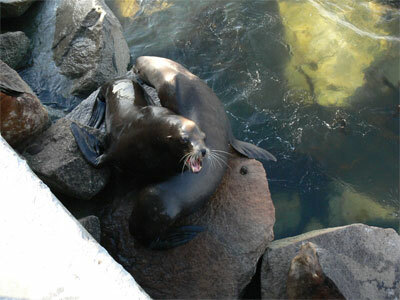 I also saw a dockside restaurant maintenance lady spray a few of them with a hose to chase them off her pier. 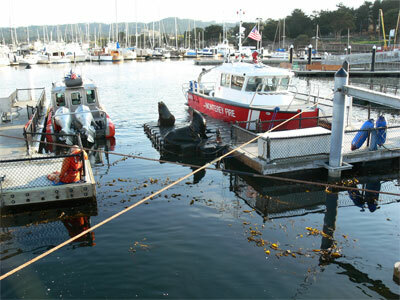 I’ll bet they are a real pest to the local marina. as it was getting late. We stopped at a motel to ask for price and availability, and they said that the jazz festival was in town, and everything was booked. However, he said we should have no problem in the next town called Big Sur. So out of town down the coast we headed. This is the first time we encountered a bit of difficulty. It turned out that all the hotels in Big Sur were also full. And so it was 12 miles further down the road to the next little town. By this time, it was almost dark, and my headache was getting worse. Again, this little town was full to capacity. We stopped to have some soup, which was all my stomach could handle, and then headed back down the road. to navigate. It was now completely dark, and we were missing all the good scenery. Another half-an-hour of driving brought us to the next town, and again, no hotels were available. The gentleman said I would need to go 30 miles further to San Simeon. And so I gritted my teeth and carried on through the night for another hour. When we finally saw the lights of San Simeon, they looked like an oasis on the horizon! It was now almost 9:30, and I needed to get somewhere where I could lay down. We ended up booking a hotel that only had a suite available. Once we got into the room, we discovered it had a large Jacuzzi. I decided I needed to relax before passing out, and so we filled it up, put our bathing suits on, and jumped in. It was indeed very relaxing to just float in the water, with the bubbles coming up around us. I got to sleep around 11:00 on a big king size bed. We traveled 494 difficult kilometres today. "the trees you visited are giant sequoias, and not redwoods. 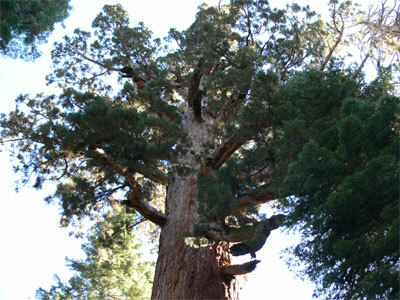 The two trees, while related, are different. I was reading your travelogue and noticed that this entry called the giant sequoias of the Sierra Nevada range "giant redwoods" -- which they're not. Perhaps you're unaware, and it's a bit confusing, but the coast redwoods and the giant sequoias, though closely related trees, are entirely different species. Adding to the confusion, the Latin botanical name for coast redwoods is Sequoia, while the botanical name for giant sequoias is Sequoiadendron. The sequoias live in the Sierra Nevada where you saw them; the coast redwoods live (as you might imagine) in a very narrow strip of land close to the Pacific Ocean along the northern California coast from some distance south of San Francisco up to just north of the Oregon border. 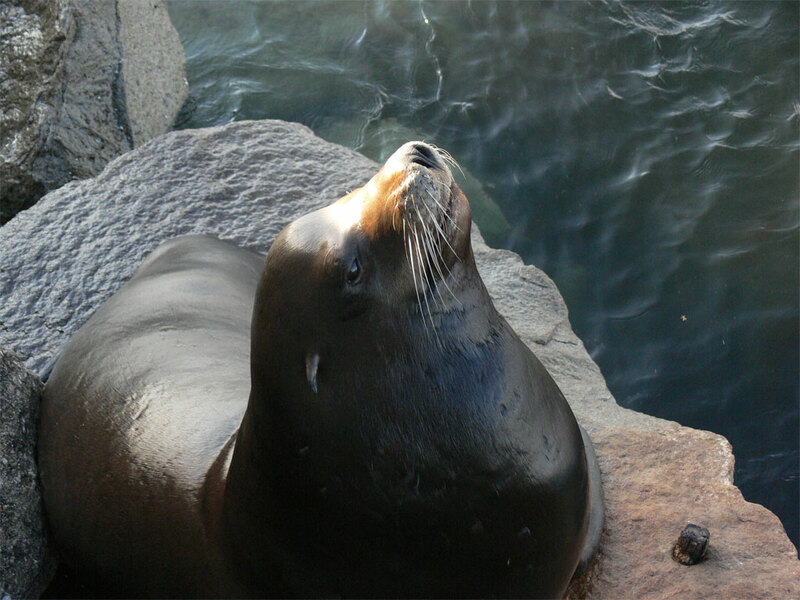 The two species have no range overlap." I've corrected my journal. Thanks Zandt.